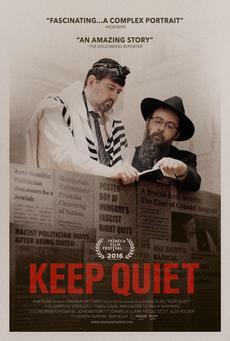 This is a fascinating documentary about a young burly Hungarian neo-Nazi leader, Csanad Szegedi, whose identity is smashed to smitherines when he discovers his maternal grandparents were Jewish and that his beloved grandmother who survived Auschwitz had hidden her faith, for fear of further persecution. In the opening minutes of the documentary, we learn that a failing economy led to the rise of nativist right-wing parties such as Jobbik, one of whose leaders was the charismatic Csanad Szegedi. He helped found another extremist organization the Hungarian Guard, a militia that was inspired by a pro-Nazi group complicit in the murder of thousands of Jews during WWII, which was outlawed for bring clearly fascist. (Note that according to the notorious Nazi Adolf Eichmann, during the Holocaust Germans had an easier time arresting up and exterminating Hungary's Jewish population because it had so many willing local accomplices) Notwithstanding that the Hungarian guard is banned the firebrand Szegedi enjoyed a rapid ascension in politics, and at the age of only 27 was elected to the European Parliament in 2009. As vice -president of Jobbik, Hungary's far right extremist party, Szegedi made anti-Semitic comments playing on the centuries old canard about Jews controlling finance and media worldwide so as to oppress patriotic innocent white Christians. While no one openly advocated exterminating Jews, Szegedi engaged in Holocaust denial. But when one of Szegedi's right-wing comrades confronted him with proof of his Jewish ancestry, and as a result his political career in Jobbik is over.